Remembering what my father had called my choice of car from all those years ago, I thought that would be a nice touch to remember him by. Then I looked up the word Flivver in the dictionary "A derogatory name for a motor car". Well I had a lot to thank my father for so the name stuck! 2006 - fame at last for Flivver! The Berlin 9th International Rally. 2007 - A trip to the Danube. 2010 - Trials and tribulations. Robert H. Wilson at the wheel in Aylesbury in 1965. The car was manufactured in 1936 and first registered on 2nd September 1936. The chassis number is 0418 so it was the 167th MG TA manufactured. (They started the numbers at 251 the telephone number of the MG factory in Abingdon). 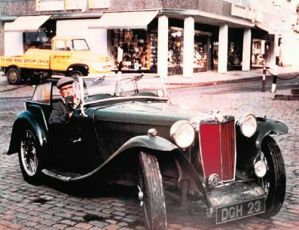 The photograph shows Robert H. Wilson at the wheel in Aylesbury in 1965. Mr. Wilson is the uncle of Martin W. Bastion to whom he sold DGH 23 for £200 in late 1970 or early 1971. The original owner, Mr. O'Dell, was Mr. Wilson's Godfather. It was then sold to Mike Feeny who stripped it down to restore it, but never got round to it! It was then sold to Ken Williams in boxes in 1985 who then restored it to an as new condition by 1989. It is of interest that Ken did all the work himself on the car except the chroming and the upholstery. In the ten years to 1999 the car had only done 4100 miles so Ken Williams due to ill health, reluctantly, decided to sell the car. I purchased it from him in April 1999, but in the time between agreeing to purchase it and take over the ownership Ken Williams past away. His wife Joyce proceeded with the sale, as she knew that Ken had found a good home for DGH 23 and for what had been for him a labour of love. 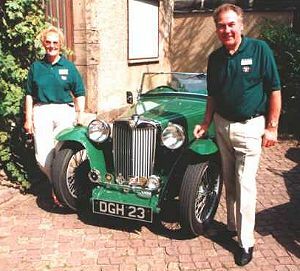 In the three years that my wife and I have owned it we have travelled 9,000 miles including the millennium MG Event in Berlin and this year (2003) two weeks in Holland and Belgium.